Image example Notre Dame cathedral take 182 years to build according to architecture expert Jeremy Melvin wey say e give us an idea into di way pipo bin dey tink, feet and work during during dat important period inside in European history. French President Emmanuel Macron don promise say im go use just five years re-build and make Notre-Dame cathedral even finer. One big fire on Monday burn di 850-year-old Gothic building, wey scata much of di roof and e cause di steeple to collapse. Dis time wen e burn, ogas for di area say di cathedral na minutes remian for di church to destroy totally. But upon wetin oga Macron don promise experts say di reconstruction fit take tens of years. "Di reason why I go say e dey possible na becos now dem dey try to rebuild something wey dey before, something wey dem get document of and plenty pishure too e dey always fast to do something di second time." "Secondly dem go use modern technology to take achieve dia goals as e be so e dey look like say money no go be problem for di project I sure say apart from di private investors and pipo wey promise to donate money you also get di French goment becos of pride, culture and history dem go support di project." - Ebi Bozimo wey be Architect tell BBC Pidgin. So di knowledge dey dia, technology off course better pass as e dey before di goal dey very clear for everybody wey dey involved and off course di national pride so di ginger dey dia say e fit happun, Ebi add. "Di only challenge na say dem need to do some test to check di structure afta di fire incident, so di test and result fit slow down di work but e dey very possible five years na like 365 days times five days na long time with very discipline and well managed program." Fifty pipo go investigate wetin cause dis fire wey happun om 15 April 2019. Oga di law for Paris Rémy Heitz say notin dey to show say na pesin cause di fire and dem dey treat di fire as accident. 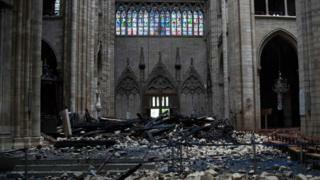 €800m ($902m; £692m) put togeda na im companies and business pipo don already promise to help rebuild di Notre-Dame Cathedral wey be Unesco World Heritage site.